This page was developed for school students interested in studying family history as a research project for their South Australian Certificate of Education (SACE) but I have now added personal links too. These shows will soon reveal how exciting and interesting unravelling your family history can be. Go to SBS, and choose an episode. Digital voice recorder. Small but powerful. Your mobile phone probably also has a recorder. This allows you to concentrate and not have to take notes. Sound files can go straight online as MP3 files. Make sure to have the recorder on as soon as the interview begins as useful information can be obtained even during an introductory chat. Notebook-keep all of your information in a notebook. Write down the date and heading for each entry including phone calls and texts related to the topic, visits to the library etc. Use only one book at a time as everything is then automatically in sequential order when it comes to reflecting on what you have done. Number and date new books sequentially too. Scanner-scan original photos and documents into a computer and then you have copies when you need them. Label each picture/document explicitly. Camera or mobile phone-A photo of an existing picture or record often comes out surprisingly well, if you are unable to copy it. USB stick-always handy for storing data. Directories, almanacs and gazetteers are useful for tracing the addresses and movement of your ancestors though all the information may not be accurate. Sands and MacDougall Directories for SA are to be found at the State Library of SA and are now online. Electoral Rolls wonderful for tracing family if you know where they lived. SAGS (SA Genealogical Society) Database of births, marriages, deaths, newspaperbirth and death notices. SA Genealogy on Facebook with Michelle Scragg. TROVE at the National Library of Australia (NLA). Search for family stories in those newspapers which have been digitised. Commonwealth records at the National Archives-defence forces, immigration, national security, prominent figures etc. Search the NAA records. Australian War Memorial for those serving in various wars. Military records, US and elsewhere. State Library old colonists records. Australasian Legal Information Institute: Type in a name and come up with a surprising number of cases! Centennial Park Cemetery, Adelaide, SA. Obituaries AustraliaYou can upload the obituary of a relative if it has been published in a newspaper. Family Search: new records added recently. Go to the State Library in North Terrace, Adelaide and explore their text collection and online resources, some of which are only available in the library. You can get one hour of individual help with your family history research if you book in advance. You can check newspapers on microfilm for stories about the family and for family notices. Recent newspapers have not yet been digitised. Explore directories like Sands and MacDougall, gazetteers and electoral rolls for addresses, occupations and dates. The State Archives have now been moved back to Gepps Cross. Check their catalogues online and order material. Visit the Genealogical Society at 201 Unley Road, Unley, to search their excellent collection. You will have to pay a fee if you are not a member. A family history text, if it exists, may be found at the genealogical society or state library or some family members may own a copy. If you know the name of a book, you may be able to track it down via the internet. Local history texts about a district where your family lived might also contain information about them. Here are some I consulted for my paternal family history. A History of St Canute's, Streaky Bay by Ellen Bascombe, Streaky Bay, pub Sept. 2012. Available from author. A Wee Deoch and Doris The House of McEvoy, by Robert J. Munro compiled 2003 revised 2011, updated as information received. Where's Piednippie? A history of the district to commemorate the 50th Jubilee of the Piednippie hall. Compiled by Fred Gerschwitz, 1983. Just because some don't have the same surname doesn't mean they are any less your ancestors. Page created 16-1-2011; Updated, 5-7-2018. 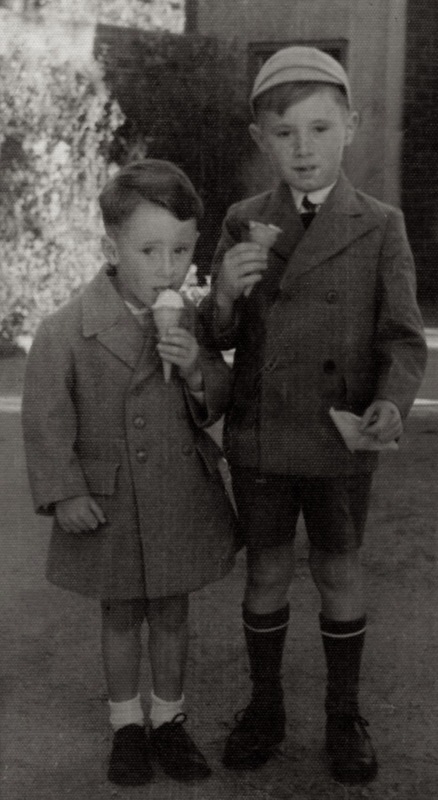 Picture: Jonathan and Christopher McEvoy eating twopenny ha'penny icecreams, c. 1950. The story goes that one morning, very early, Chris and Jonny woke up the nearby shopkeeper to buy 2 icecreams. The shopkeeper is reputed to have said, "Bugger the twopenny ha'penny icecreams!" 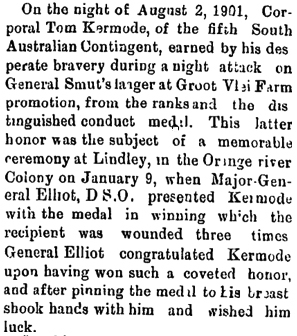 News article about my maternal grandfather from The NZ 'Evening Star' newspaper of 13-3-1902, found in New Zealand's Papers Past.